Really, all of us . . . but more on that in a minute. 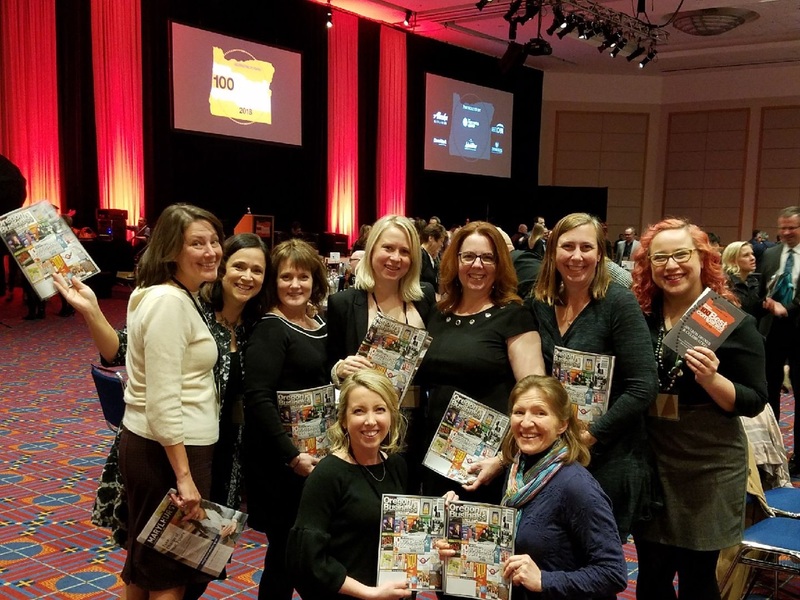 Last Thursday night we attended the Oregon Business 100 Best Companies to Work for in Oregon awards dinner and learned that we, The Hello Foundation ranked 87th overall. We were also ranked as a mid-sized company and in that category, we ranked 34th out of 34 mid-sized companies. We were just one-tenth of a point less than 33rd, and #30-32 were all just one point away. I really was flattered our benefits, compensation, and employee experiences ranked us as high as they did. And frankly, after last night’s event, I’m sort of amazed we ranked at all. We were the lone Kid-Oriented business, surrounded by lots of construction companies, firms of lawyers, accountants, tech firms, and the like. As leaders and employees both took the stage one after another, I was stunned at how young so many of those employees were. Some of these perks seem meant to keep them at work. As much as I’d like to play foosball with anyone on my staff, I take great pride in sending them home at the end of a reasonable day. I’ve always presumed that, above all else, staff would rather be with their families and friends than at work. That when people who care for kids feel cared for themselves, they’ll do amazing work for the students and families they serve. And when that happens, we really are all winners. I walk tall knowing we’ve created a culture that advocates for paid family leave and leaves onsite Happy Hour to someone else. Only one will enrich the lives of children. And that’s what we’re all about.